To Sum It Up: Noemi Vidal is ready to die for her home world of Genesis in its ongoing war with Earth, but her path takes a different turn when she ends up on board a ship that was abandoned thirty years ago with only a robot mech named Abel left behind. Abel longs to reunite with his creator, the renowned genius Burton Mansfield, but Abel’s programming dictates that he must also follow Noemi’s orders, even if they aid Earth’s enemy. As Noemi and Abel traverse multiple planets together, what began as a machine obeying its instructions becomes far more complicated, as Abel discovers just how much he’s evolved over thirty years and Noemi cannot help but see him as more than a mech. Review: FINALLY—my first 2017 read above 3 stars! I’ve been in a horrible reading slump since late 2016, really, and I’d started to worry that it would never end. Thank you, Defy the Stars for breaking me out of the slump at last! I’m sure that I would’ve loved this book as much as I did based solely on its own numerous merits, but the way in which it reminded me of HBO’s Westworld, a show that completely blew my mind, just pushed Defy the Stars over the top. Abel, one of the novel’s two main characters, is a mech, a combination of organic parts and technology, modeled after his brilliant creator, Burton Mansfield. Mansfield’s genius is so acclaimed, he’s practically a mythical figure. I did feel that there were even a few parallels between Mansfield and Westworld’s own mastermind, Dr. Robert Ford. I absolutely loved Abel and his story line. After Mansfield and the rest of the human crew on board the spaceship Daedalus abandon it, Abel is stranded in space, all alone for thirty years until the book’s other protagonist, Noemi, unintentionally finds both the Daedalus and Abel. Although Abel’s been programmed to protect Mansfield, the man whom Abel considers his father, Abel’s programming also directs him to follow the orders of the highest human authority on the ship. Noemi ends up being that human. On Genesis, Noemi’s home planet, mechs are seen as soulless killing machines; having to place her trust in a mech goes against every one of her beliefs and instincts. Abel, being as advanced in intelligence as he is, realizes that his rescue from isolation may be short-lived with his fate in Noemi’s hands. Claudia Gray gives both of her protagonists so many layers to their characters and develops them wonderfully. Noemi is a fierce fighter, willing to do anything to save her planet from being destroyed by Earth. Although ensuring a future for Genesis remains close to Noemi’s heart throughout the book, traveling to other planets with Abel opens her eyes and mind to the possibility that Genesis’s strategy for ending the war with Earth might not be the only way. Abel and his evolving programming also challenge Noemi to question everything she’s ever believed about mechs, which she’s encountered in battle all too often. Abel, however, proves himself to be a different kind of mech. He is the only model of his type, programmed with the skills of the other mech models but possessing a continuously developing personality. Sometimes Abel himself pauses to wonder whether a new feeling he’s experiencing is merely a malfunction or part of Mansfield’s design. The line between man and machine becomes very, very fine, and Gray just nails this aspect of the book. One thousand percent. It is so, so, so easy to forget that Abel is not entirely made of flesh and blood. He’s even got some sass! Abel melted my heart, too, which is not an easy feat. I’m kind of a reluctant sci-fi reader; previous sci-fi books that I’ve read were too heavy on the technical details of the world and/or contained lots of info dumps. Defy the Stars features the perfect amount of world-building, enough where I feel immersed in the world but without being overwhelmed by endless minute details. The best thing about the world-building here? It’s done through showing, not telling! My last few reads employed a lot of telling, and it was exhilarating to finally encounter some skillful showing. I’m still thinking about how amazing this book was, which pretty much illustrates the amount of love I have for it. 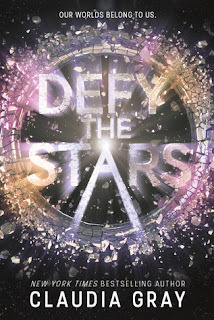 Defy the Stars is a thrilling sci-fi adventure that also stirs the heart and asks how human a machine can be. There are many facets to this book, and each one is highly compelling and engrossing to read about. All in All: Defy the Stars was so damn good! Westworld fans should find this especially intriguing, but even if you’ve never watched the show, this is such a winning, thrilling sci-fi novel! So I don't think I can wrap my head around this book if it's similar to Westworld, a show that blew my mind too. All the ins and outs are so brilliant and complex I have to take it in slowly so I can truly understand the plot. It's one of those things where you can't take things for granted with the hopes that it will work out for me in the end. The complex world makes the plot and sadly my brain capacity isn't wired for sci-if much hahaha. So sad, I know! My brain isn't wired for most sci-fi, either, lol, but this one hit the sweet spot with the amount of detail- not overly complicated, but definitely not shallow. Where I think this is most similar to Westworld is in the question of where the line is between humans and machines. The story and timeline are straightforward, where you know how in Westworld both are insanely complex, LOL! This sounds so good. And I love the Westworld reference- that show was a trip so if it reminds you of that then I'm definitely interested! I like the sound of Abel's developing personality too, and how she nails it. Abel's character development was amazing! The constant evolution of his programming reminded me so much of the hosts on Westworld, which messed with my head SO. MUCH. Lol. I can't wait for a new season! Aww, thanks! ♥ It felt so GOOD to finally read something I really, really enjoyed! This is the first Claudia Gray book I've read; I definitely want to check out her Star Wars novels now! The way you describe Abel is kind of reminding me of Data from Star Trek, so I'm very curious to pick this up! I haven't seen Westworld, although I've heard such good things about it. Hopefully I can watch that sometime soon! Yay for a book that breaks you out of your slump! YAY! I'm so glad you got out of that reading slump! It's so hard sometimes. This sounds like an excellent read. I'm like you and am hit or miss with sci-fi reads. The really good ones though I tend to love. The world building and character building with this one sound perfect for making that happen. Excellent review! I definitely, definitely recommend this one! It's not overly technical, and the character development is amazing! I've just finished reading this book and I too loved it! I agree that the world building was spectacular, we were shown the world and not told it. It's one of the main reasons I loved this book! I also really loved the idea about Mechs. I feel like it's a bit hard to get around the fact that Abel was created, started off as a machine, but is now a person. But I love that. I'm so excited for the next book! Yay- I'm thrilled that you loved this, too! The world building in this book totally rocked! I had a run of books where there was so much telling, and it was just wonderful to finally read a book that got the showing right. And Abel- such a complex character and so brilliantly written. I can't wait for the next book, either!